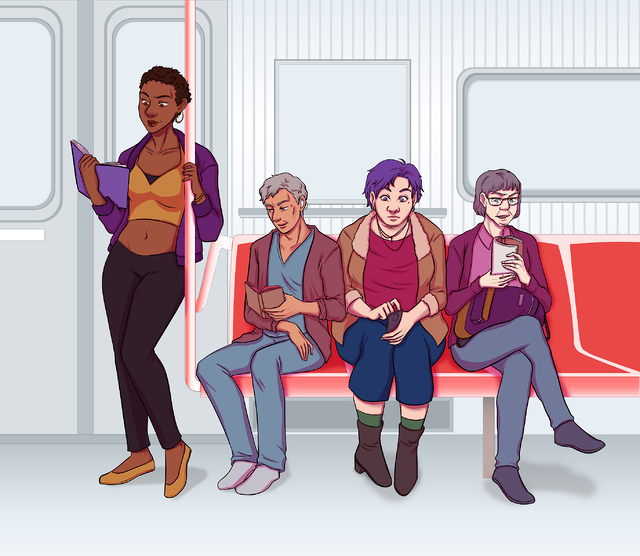 First things first - this is not a romance, but it is a very queer story.. The story pulls from both the folklore of Robin Hood and from historical record and speculation about King Richard the Lionhearted and his seneschal. There's a lot to be said for revisiting history through a modern lens and realizing that a lot of the men we think we know were more complex and more queer than we've been taught. This graphic novel has many content warnings, however, please head to the bottom of this review for a list. 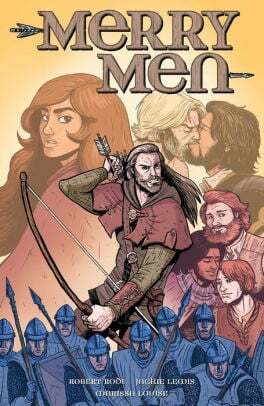 Merry Men follows Robin and his group of Merry Men (queer men) as they move from hiding out in Sherwood Forest to actively pushing back against Prince John and the Sheriff of Nottingham. Prince John has been giving control of five counties while King Richard is away, but he must remain in France during this time, a decision that limits John's ability to take over England while his brother is absent. John and a corrupt clergyman hatch a plan to ruin Robin's life (Robin being the favorite of Richard) and thus begins a campaign of raids and taxes and imprisonments that ultimately send Robin and his friends to the forest. You see, no one cared that men slept with men until now. It was seen as a behavior not an identity (so says the epilogue) and not a big deal as it would later be. We learn through flashbacks that Robin was the lover and companion of King Richard during the crusades and sent Robin home with a generous pension when he was injured. We also learn of the terrible Guy of Gisborne, who shows up in flashback and then in present day as a villain sent by the Sheriff. One day, a young trans woman named Scarlet shows up in the forest, looking for Robin and his Merry Men. She brings word that her lover, Daniel, has been imprisoned, and pleads with Robin to free them. After deliberation, the group sets out and liberates the nearby town of Elton. When they get to the prisoners, however, Daniel isn't among them. They later find out why when they receive Daniel's hand in a sack. This is the part of the story where the action picks up, with Guy of Gisborne back to get revenge on Robin by dismembering his friends. It's really gross and Guy is an over-the-top villain. I think we could have gotten the point without so much on-page horror, to be honest. Before everything is wrapped up, the Sheriff of Nottingham arrives to take the Merry Men off to jail, with hostages to get them to comply. He brings one young man's homophobic father, another's wife and children, another's sister, and another's wife... as the Sheriff's bride-to-be. I was disappointed in this part of the book - women are literally used as props. It's bad enough that queer women are largely left out of the narrative (with the exception of Scarlet, who does have a good arc), but to bring in the wives and children that these "good" men left behind to fend for themselves, only as hostages? Hmm. Then we're supposed to believe that these women still take the side of the men in their lives. I'm not sure how the writer could have better negotiated this, since it's clear that he wanted to make the point that a lot of queer men had families because it was the done thing, but to bring them in at the end felt icky to me. Let's move on to the content warnings, since there are many. Content Warnings: Homophobia, transphobia (Scarlet's parents, not on page but mentioned), murder, the Crusades... and now let's talk about Guy of Gisborne. Guy is set up as the most evil of evil men. He takes a young Saracen boy as his "page" so that he can sexually abuse him. (Robin takes the boy in and he becomes part of the group of Merry Men as an adult.) The abuse is not depicted on page but will be triggering to some. Guy dismembers people and enjoys torture. It's suggested that he also rapes his captives during the torture. He makes a leather outfit out of Daniel's skin. Again, why was this necessary? I got that he was evil just from the dismembering. If you've made it this far, you're probably waiting for me to tell you whether you should read this or not. I think that, if you can stomach the content mentioned above, that you should. I've read a lot of Robin Hood retellings and this was a fresh but familiar story, full of queer men and their love. The illustration was perfect for the setting, and I think the price point is reasonable as well. It's just not as fluffy as I was expecting it to be.